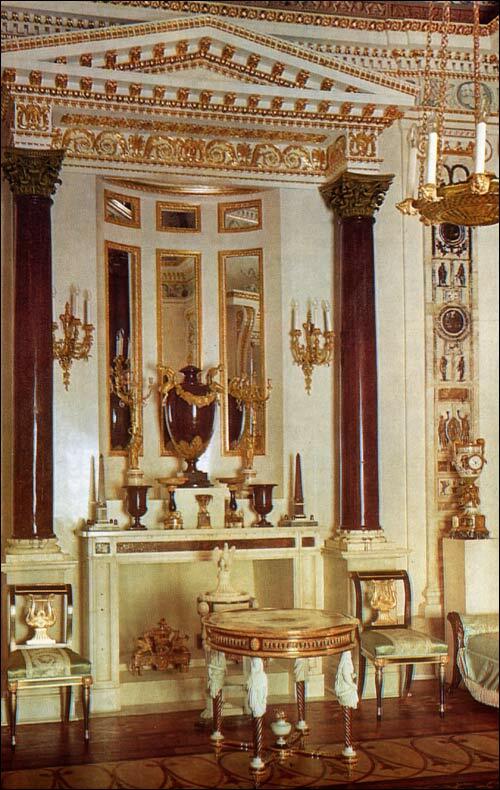 The Boudoir of the Empress has, to a large extent, retained the rich architectural decor created by Brenna in the early 1790s. Its walls are decorated with marble pilasters made in Rome and painted with grotesque motifs copied from Raphael's Loggie in the Vatican. The spaces between the pilasters are decorated with eight landscape panels reproducing Indian views, by Thomas Daniell, engraved by Thomas and William Daniell, English landscape painters who had extensively travelled in India. Of the marble reliefs, two are genuine Roman antiquities dating back to the second century AD. One of these is a half-length portrait of an elderly Roman, the other shows a terminal figure, with a reed-pipe on the pedestal. The oval bas-relief portraits of Alexander the Great and his mother Olympia are eighteenth-century Italian. The Boudoir's elegant fireplace with a niche decorated with mirrors is set in a portico with two monolithic porphyry columns brought from Rome. The classical portico with a pediment is the compositional centre of the interior. The colourful ceiling with four architectural landscapes, presenting morning, day, evening land night, was painted in 1804 by Giovanni Scotti from his own sketches. And the groups of cupids with wreaths of flowers, topping the door cornice, as well as the gilt ornaments on the door panels, are based on the designs of Voronikhin. 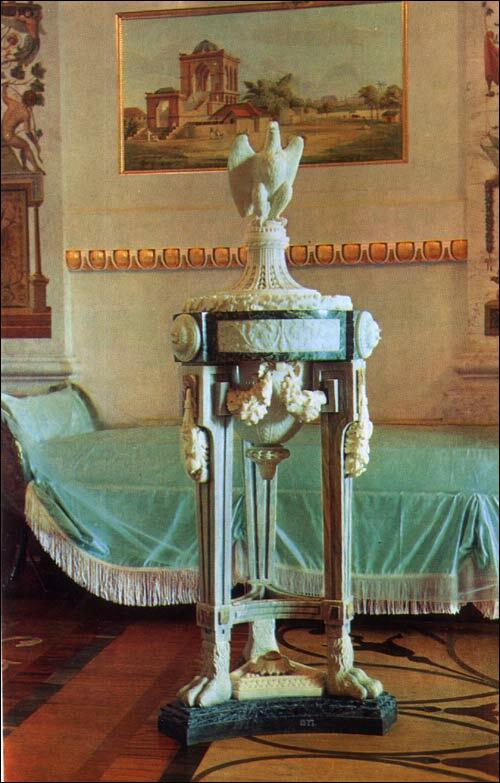 The furnishings of the Boudoir are in perfect accord with its architectural decor. 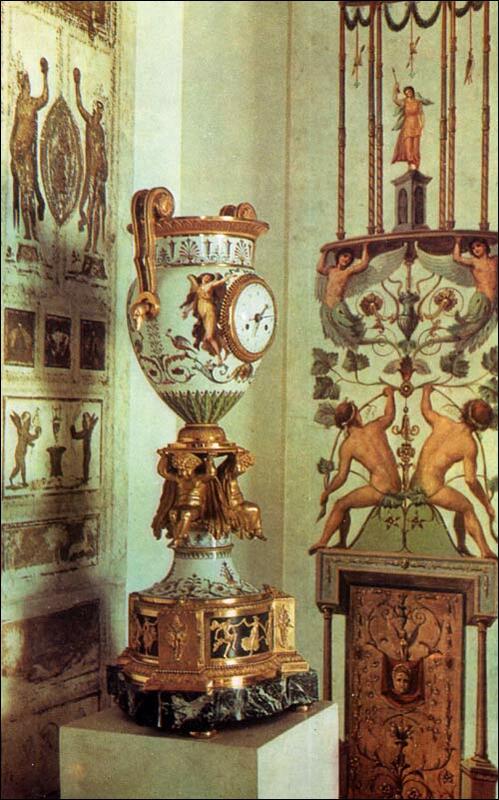 The large vase of porphyry, adorned with chased ormolu, which was made in 1789 at the Kolyvan Factory, and the various other objects in coloured stone which stand on the mantelpiece, harmonize excellently with the porphyry columns of the portico. The colour of green antique bronze, imitated in the painted-figures on the ceiling, which represent classical sculptures, and on the furniture made in the classical style from Voronikhin's designs, is echoed by the greenish tone of the crystal chandelier shaped like an antique lamp, suspended on long slender chains. Two mahogany secretaires by David Roentgen and a writing-table stamped P. Denizot, a twin of the one in the Study of Paul I, with a revolving-band clock and candlesticks, also deserve to be mentioned. The elegant piano in a marquetry case was made in 1774 in London. It had once stood in the Rose Pavilion in the park, where it was used by many celebrated musicians visiting Pavlovsk; but the Rose Pavilion perished, like so much else, during the war. A very interesting piece of furniture is a round table with rich ormolu decorations, made at the St Petersburg Imperial Porcelain Factory in 1789. Its top, almost a metre in diameter, is of porcelain; it bears a picture of the Pavlovsk Palace as it looked in the days of Cameron. The firing of so large a slab of porcelain was quite a miracle of technique in those days. Caryatids of white glazed porcelain adorn the legs of the table. The contrast of the brilliant white of the porcelain, the dark hue of the finely patterned burr, and the chased ormolu decorations, make it an object of exquisite beauty. No porcelain factory in the country has produced a comparable piece of furniture ever since. A clock and candelabra of Sevres porcelain with bronze decorations, a perfume burner of coloured Italian marbles - a gift of the King of Sardinia - and many other remarkable objects complete the decor of this magnificent interior.